Would Elway Consider Kyler Murray? Thread: Would Elway Consider Kyler Murray? Stephen A also said haskins is a running Qb lol. He the most prototypical pocket passer in the Draft group . Hes a joke imo. Well Stephen A is an idiot. Kid had 108 yards rushing last year...Stephen A. basically showed how little he knows about football with that ridiculous take. While I would agree he is worth a 1st round pick I still wouldn't give it, not if everyone knows they are going after Murray. If they are going to take Murray and the rest of the teams know it the other teams hold the leverage. If I'm Elway, I offer up our 2nd round pick 1st and try to sweeten the pot with a player if that's not enough. If we can get Rosen and keep our #10 pick??? How freaking sweat would that be?? I had this discussion with my brother last year before the Penn st game. He said he hadn’t watched him but had a buddy say Haskins was your typical Ohio st dual threat qb who mostly ran and padded passing stats in blowouts. I of course googled his stats and pointed out how he had hardly run at all to that point in the season. And he was anything but a dual threat qb. I really don’t understand where people keep getting this impression that Haskins is a big time running qb. The only thing i can come up with is people who didn’t actually watch him see the color of his skin and “assume” he must be a runner. Because it’s really not that hard to look up him game stats and see he didn’t run much at all. In my brothers defense Penn st was fairly early on and he hadn’t watched him yet. For Stephen A after the season it’s just lazy to not have figured out his style and stats by now. I really can’t think of any other reason anyone would still think he is a mobile qb other than either color of his skin stereotype or just plain idiot. That’s just it though, no one knows what the Cardinals are going to do. Of course the Broncos should try to keep there 1st round pick, but they should try to get Rosen before another team convinces them to give up the first overall pick. That could mean giving them the #10 pick. I don’t know what Arizona’s cap situation is. Maybe the Broncos could give them Miller and a third for Rosen. Lol Miller and a third for Rosen??? It’s hilariois how quickly fans turn their backs on players around here. If Elway gives that up for Rosen I’m done watching Broncos football for years. That would be the worst trade ever and would set this team back half a decade if not longer. Sure this team can no longer win with just defense alone. But Rosen isn’t worth Von alone let alone us throwing an extra third round pick on top of it. I want Denver to become its offensive powerhouse self again and we're going need it if we want to be able to compete with Mahomes on a consistent basis. Imagine playing second fiddle to the Chiefs the next decade or longer. 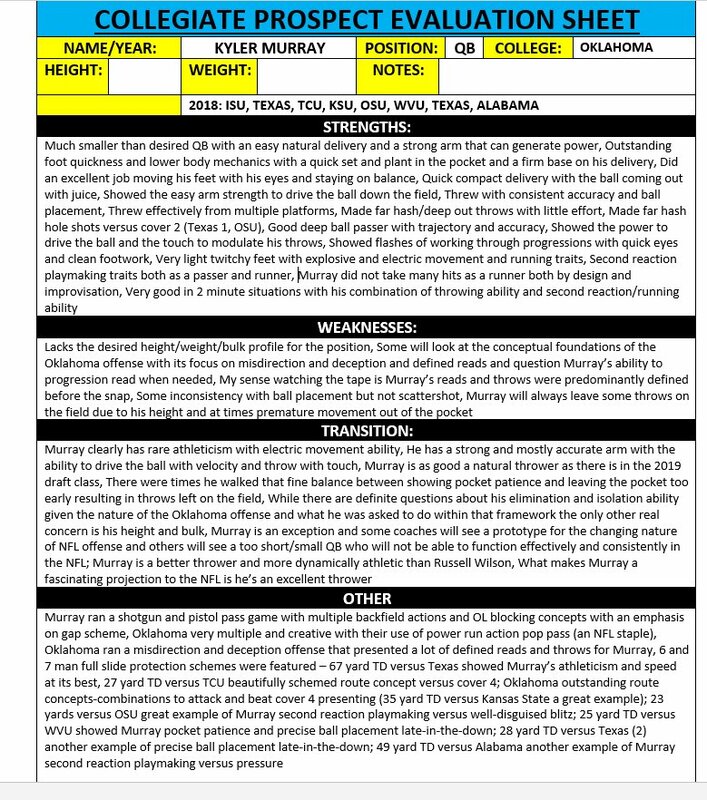 Murray is the one guy in this draft that I truly believe can elevate an entire offense and make things happen. I agree 100% with this post. On top of that, the evaluation was diligent and based off actual film study, NOT opinions and perceptions based off of stereotypes. Put Murray with Lindsay, Sutton, and Hamilton and watch our offense open up. A dynamic QB will bring the best out of our weapons. While I agree that trade doesn't favor us right now, that is not a trade that would set this team back. Chubb was drafted to replace Von at some point and Von does not have 6 more Von type tears left. By the time his contract is up and ready to renegotiate Chubb will be looking for an extension, I dont see them both signing for team friendly deals. Belicheat is notorious for trading talent in the middle of their careers to maximize top trade value. They're not fan favorite moves but it's also what keeps that team at the top every year. I want to see Von retire a Bronco...start and finish his career here. But, that just doesn't happen anymore. If Payton FREAKING MANNING can get sent packing so can Von. There isn't a guy in the draft capable of that... This QB class suuuucks. The problem with that thinking is there are a lot of teams that want Rosen. New England included. That drives the price up. There will be enough people fighting for Rosen that there is zero chance IMO that he goes for less than a first IF Arizona decides to trade him. The QB's who will be coming out next year look far better than the garbage this class has to offer. I don't see Elway making a move like this but I'd LOVE to be wrong! I also don't see him getting Rosen, absolutely zero chance that happens. I just hope we don't end up with Lock. That alone would be a win in my book. Please, no more raw QB prospects that fold under pressure. Broncos Country will eat them alive and we'll be back to square one. Last edited by BroncosDivision; 02-12-2019 at 11:39 AM.